Here you will find the set of rules that must be followed when third party PSD designs are created. No icons should be created as images, but font should be used instead. If you are using some of the existing icon font families, please specify which icon is from which font pack (font awesome, entypo….) or if you have custom icons, please provide appropriate .svg file and make sure that svg is in one colour (transparent background, only one colour on the front) so we can create font icon out of it. Tile for backgrounds (page, content, header, footer) if you have specific patterns for background. Do not Stretch / Rasterize type! Heading, sub text, set of paragraphs, all should have their own text box. Picture and the frame, text box and the button, four layers total. Our developers usually slice websites from well organized .PSD files as mentioned before. 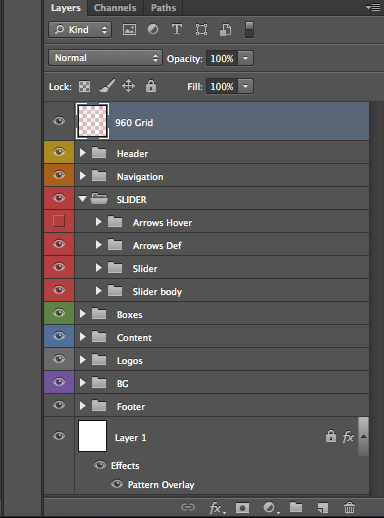 So it would be nice if you can export an .psd file directly from your Adobe Illustrator and than organize the layers in groups. If you are working with high resolution files, images, please resize the final layout so the site content fits in 1200px grid and all elements are appropriate size.